Only two years after its formation the club took part in the first ever correspondence match between two clubs, when in 1824 it had the temerity to challenge the established and powerful London Chess Club. This was to play a series of games by correspondence, the moves being sent by letter, which in those days were carried by horse and carriage - an expensive business since the “Penny Post” would not be introduced until 1840. Three games were to be played with any drawn games being restarted, and two games would be in play at any one time. The losers were to present the winners with a silver cup to the value of £25. The challenge was widely regarded as being something of an impertinance and no-one expected anything other than a decisive victory for the London side. They had by far the more experienced players, led by the the top English player of the day, William Lewis, assisted amongst others by John Cochrane who was probably the next ranking and gave his name to a number of gambits. Against them Edinburgh's players were mostly unknowns apart from their one outstanding exponent, James Donaldson. The match saw the first recorded use of the Scotch Gambit, which strangely enough was first used by the London players. Edinburgh liked it so much that after fierce discussion they adopted it themselves and used it to great effect in two games. 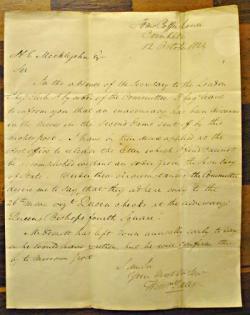 The moves were published in a number of newspapers and drew considerable public attention and not a little controversy when in one of the games the London club attempted to retract a poor move in a critical position, even applying unsuccessfully to the Postmaster for the return of the letter. The Postmaster having refused, the Edinburgh club took the stance that a move once posted was the equivalent of a piece having been released and the move thus completed, and the game was eventually won by Edinburgh. Such was the passion generated that there were still heated letters being written to the chess journals on the subject in 1850. Needless to say the two clubs' versions of events differ somewhat in the match books produced afterwards, which we still have in our library. We also have the original letters with their wax seals, which carried the moves between the two capitals. The match went on for 4 years, during which time 5 games were played with the two drawn games not counting, two being won by Edinburgh, and one by London. 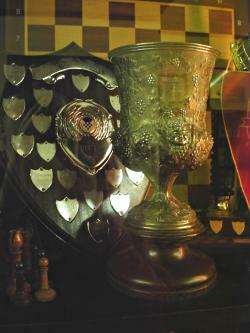 As the winners of the match, Edinburgh took possession of the promised trophy which was promptly christened the Scot's Gambit Cup, and which still holds pride of place in our trophy cabinet. The match games are included here in PGN format. If the play occasionally seems primitive to our eyes then it must be remembered that this was the same year as the invention of the Evans Gambit, and 10 years before the match between La Bourdonnais and MacDonnell. Indeed it was only a few years earlier in 1808 that the final decision had been made to have the rule on pawn promotion amended to the modern version - a development which the London Chess Club had been instrumental in. Bilguer's Handbuch was not published until 1843 and the rise of Staunton was still some way off. Rather we should enjoy the games in the spirit of the pioneering age to which they belong.